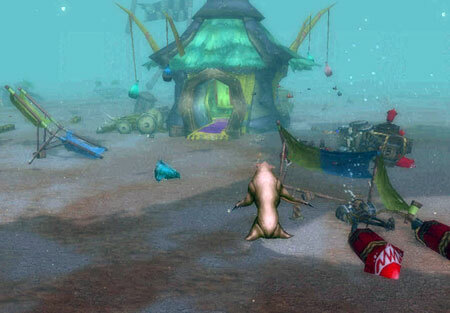 I while back I stumbled on the Darkmoon Faire site. It was a Friday afternoon and I had no more work. I saw the image contest so decided to do an ad for it to avoid organizing files on my computer, sending out invoices, straightening the room. So the above image is the ad, although I forgot to actually enter the contest. So anyway, where is he? 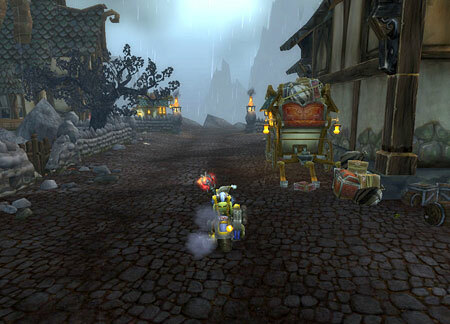 I admit that like a lot of others when I woke up to the new Azeroth I was a little disconcerted. I felt that I’d slept through something really momentous but then I was soon distracted by all the newness. 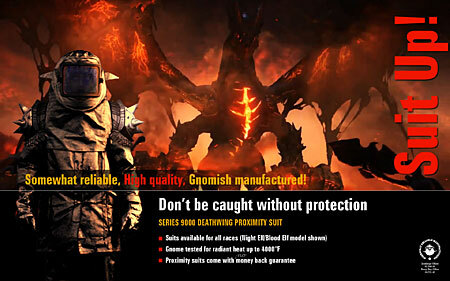 My mission became to find Deathwing. I wanted to see the source of all the destruction and shake my fist at him at the very least. Sure, I want the achievement but I have a burning desire to just look at him, I wanted to see the one whose release from the earth was the catalyst that shattered my world of the last four years. So I set forth on my journey of discovery and nope, not a peak or a sign of him yet. Can’t find him anywhere, I somehow didn’t think he’d be this shy. 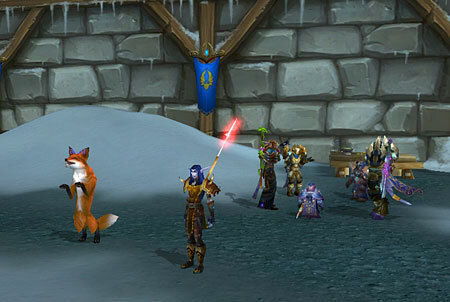 So while I travel Azeroth in search of Deathwing am I righting wrongs along the way, fighting dangerous beasts? Oh hell no, I’m searching for vanity pets, I’m kicking goats off the moutain, you know the important stuff. I’m still trying to get my Brazie’s Sunflower but I’m still stuck on the last quest Lawn of the Dead. I don’t mind too much as once I complete I won’t be able to play the game anymore. 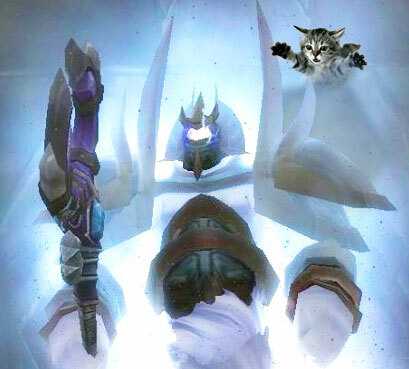 I wish that Blizzard had left Deathwing ominously flying around menacing us for a while, not killing just menacing so we’d have more of a feeling of threat from him. Right now the tension I feel is between factions, boy, things between the Horde and Alliance really heated up during my long sleep. Oh, and the other really noticeable change in the world (to me at least) is the light. I can’t get over the shadows and little pools of light. I don’t know what they’ve done but it’s really beautiful. But I digress, I have really important news! With all this change it’s good to know you can still depend on some things to stick around. The Ancona Chicken is still available, yay! Plucky Johnson and Mad Magus Tirth didn’t drown when the Shimmering Flats was flooded but apparently made for high ground. If you swim to the pirate boats and go up to their camp and make a right you’ll find Magus Tirth shooting fireballs at some chickens. Chase down the largest chicken and click and Plucky Johnson will appear to sell you a chicken. So in a time of epic upheaval and change (Noooo, The Keymaster gone!) it’s nice to know that Mad Magus Tirth and Plucky Johnson are still at it. I’ve been running around Azeroth looking for new flight paths and hoping to get burnt to a crisp by Deathwing. I was in Loch Modan to see the damage to the dam close up and decided to see if Farstrider Lodge had a fp when I saw a fox. I didn’t know if I would want to keep it, doesn’t look very ferocious, but hey we have all that stable storage now so why not. I was looking at his abilities and saw he had a bonus ability called play so I tried it and got a dancing fox! Best thing ever. I definitely think he deserves a stable slot for that. I was so impressed with him I downloaded the free version of Fraps and below you can see my somewhat fuzzy first attempt at using it. It doesn’t do him justice though I think I’ll have to buy the full version to capture all his foxy moves. So I decided to pay a visit to Gilneas. The atmosphere was decidedly spooky, I mean it was spooky poking around there with no one home, I felt like I was looking in someone’s underwear drawer without them knowing, that was part of it but the whole zone feels ominously gothic and I was looking over my shoulder the whole way. I had my camera so I’ll let you be the judge. 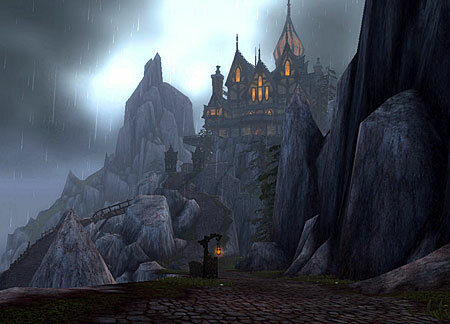 My first stop above was Gilneas City. Saw a lovely fire inside so went in. Nice place, family pictures on the wall, why had I been nervous. 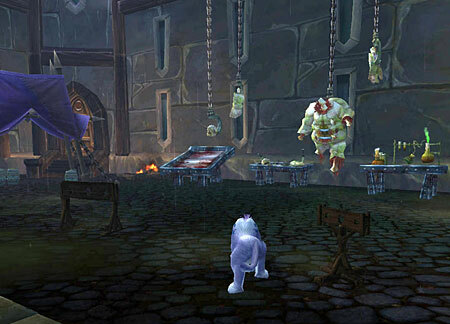 Okay on leaving the cozy fire I found myself in a courtyard, mmmm, okay nervous again, is this the ah … um … meat market? And just who all do they consider appropriate candidates for dinner I wonder, kittys? Okay, don’t rush to judgment here I’m sure there is some simple explanation, but I decided to move on. See I was being silly, a lovely village came next nothing sinister here. 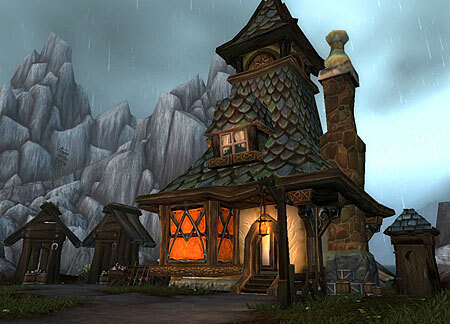 Next I thought I’d try to find Greymane Manor–supposed to be lovely this time of year. Although the Manor is not terribly inviting from the outside the inside was a little more hospitable. 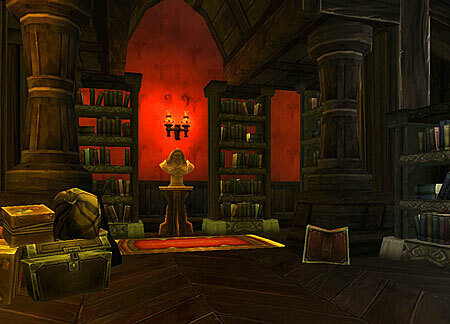 Judging from the number of books in his Manor Genn Greymane is quite an erudite King. Nothing to fear here. Silly to let a few swinging bodies spook me. My last stop was in what looked like a small fishing village off the coast, the picture of normalcy. 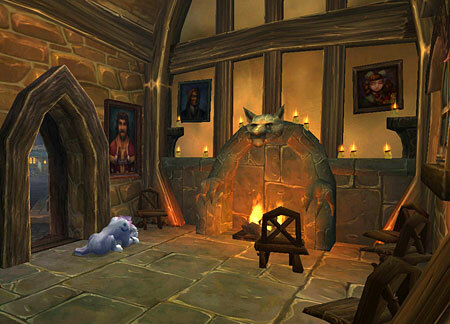 So the Gilneans were locked up behind their wall for all that time with who knows what going on behind it. But seeing this idyllic well cared for cottage I knew I had let my imagine run away with me. There was nothing strange going on here, their taste was just a little more Victorian than ours, I’m sure that’s all it is. 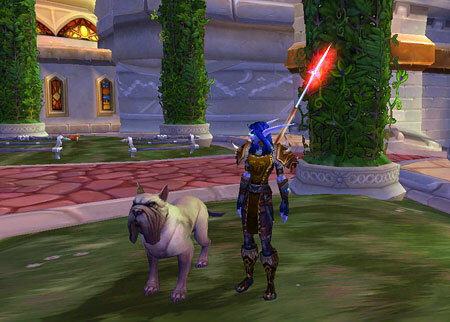 Cataclysm – Finally, I have a dog! This hunter was my first character. She’s the one who suffered the pain of no quest helper, the agony of no sparkly quest items, yes, folks she walked uphill 5 miles to school in the snow – you get the idea. At one point she semi-tired to Nagrand but then graciously agreed to come out of retirement and make flasks and elixirs for rest of my crew. She always wanted a dog but the best she could do was a wolf so I was so excited when I checked Petopia after the shattering and there were dogs, yes! I decided to get a Blighthound as I hadn’t visited Eastern Plaguelands yet so I got on a boat back to Stormwind and took the long flight to Eastern Plaguelands and set out to the Marris Stead. As promised there they were glowing an eerie green. I started taming one, well I mean I tried. Instead I got the message “You already have too many pets.” What? I knew I had only four pets with me and I was sure I had read that we would be able to call five. Long story (and another long flight) short I hadn’t known that you needed Call Pet 5 to call a fifth pet, well yeah, geez. So if you’re going pet hunting don’t make my mistake. So finally, she has a dog. I like him, he’s small enough that he doesn’t get in the way like the Devilsaur I had to have and then quickly abandoned. Aww, isn’t he cute. I thought it appropriate to re-visit the Shimmering Flats first thing today to see how it fared after the Shattering. 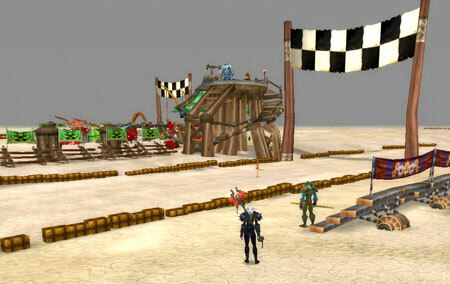 I was happy to find the remnants of Mirage Raceway still visible underwater. Floating on the water is Fizzle and Pozzik’s Speedbarge, these guys bounce back fast, they already have their new operation going. Well, it’s back to finding new flight paths and checking out what the goblins have done to Azshara! ** Just so you know, the problem wasn’t add-ons the problem was me. If you play the game you really need to keep a lot of sunflowers going to get a steady supply of suns. With enough sunflowers I made it through the third quest with no problem.